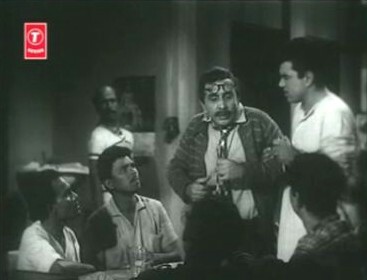 Producer (henceforth, P): Ashok Kumar, Nanda, Dharmendra, Nimmi. Those are the big names I’m going to rope in. 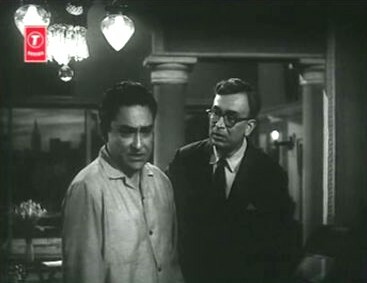 Writer (W): Ashok Kumar? Oh, good! The wise, seasoned man of the world whom others look up to. The man who’s having problems with his personal life and his professional life and his sister and his brother and… oh, okay. Sorry. I’ll tell it from the start, right? We have this alcoholic, see? He’s a good man, though. P: We can’t afford Dilip Kumar. And who’ll be the male lead, pray, if he’s in the cast? W: Will you two shut up? Listen to me. No, we need someone else. A good character actor—how about Tarun Bose? He’ll be the drunk. He’s set up a teashop which his little son Madhukar manages, with the help of a servant. 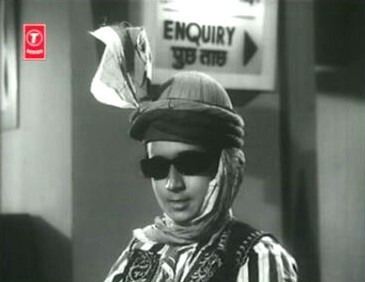 P: Let’s have Keshto Mukherjee as the servant, right? I like him; such a great comedian. W: Yes, but… the servant doesn’t have any funny lines. And he’s there in only two very brief scenes. D: Doesn’t matter. I like Keshto Mukherjee too. W: Anyway, what happens is that this drunk’s elder son Shankar drops out of school so that he can look after the family. There’s a mother, and there’s a little sister called Ruma. In his spare time, Shankar goes about doing good deeds for which he gets bashed up by random people who disagree with him. D (simpers): Yes, isn’t it? D & P (in chorus): Dharmendra!!! W: Of course not! Dharmendra’s a spring chicken, and not the main character in this story. 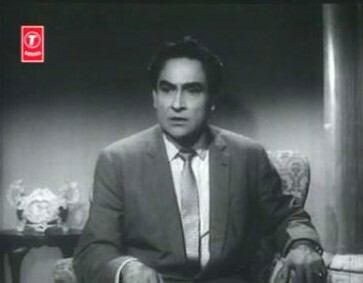 No, he’s Ashok Kumar. P (mutters to D): So what was the big deal in having someone looking like Dharmendra play the teenaged Shankar? W: Okay, let’s move on. Shankar is busy becoming a potentate, even against the wishes of his wise old uncle, his mamaji. We’ll have Moni Chatterjee play the mamaji. One day, Shankar goes to meet Mr Sinha, from whom he wants to buy an ailing textile mill. D: Why is it ailing? And if it’s ailing, why does he want to buy it? W: Will you stop interrupting?! Why he wants to buy it doesn’t matter. What matters is that while he’s at Mr Sinha’s house, he meets Mr Sinha’s beautiful daughter Baani. That’ll be Nimmi. P: But she’s in silks and whatnot, in this big, wealthy house. That’s not Nimmi! Nimmi fits tragedy, not luxury. Are you sure you don’t want someone else here? Maybe Shyama? W (smugly): Hah! But all that luxury is illusion, you see. Baani’s pretty life is all a sham. She’s mute, and so even her name—‘sound’—is a mockery. One day, Shankar realises that she’s mute, so he asks her father for her hand in marriage. D: You mean they fall in love? D: Sing? How’ll she sing? She’s mute. P (interrupting): Let’s get a move on. We can have her put an LP on and lip-synch to that. How’s that? Genius, no? D: Great! Now we’ll have some humour. How about giving him a funny accent, huh? Or he can speak in different dialects. W: Sure. He can speak good staid khadi boli at times, and Bambaiyya at others. And we can have his wife Sheila be a Hyderabadi, so she’ll speak Hindi Hyderabadi style. Let’s have Shubha Khote as Sheila, shall we? She can be good and screechy too. W: Back to the story, now. Shankar is mad at him because Madhukar—let’s call him Madhu—because Madhu is so unambitious. Shankar keeps offering Madhu jobs in his companies and his stores, but Madhu keeps refusing. Shankar disapproves of him so much they don’t even live in the same house. Shankar lives in a big mansion while Madhu lives in the old house beside the teashop, which he still runs with the help of that old servant. D: What’s his name? Ramu? W: Of course! What did you expect it to be? François? Haha! D: And what happened to the sister? W: Stop being fastidious! Does it matter? Shimla. Anyway, she’s come back, and because she wants to pull a prank on Madhu, she dresses as a Pathan, so that Madhu, who’s come to receive her at the airport, doesn’t recognise her. P: Heheheh! That’s funny. Genius, man, genius. This ‘women disguised as men’ thing always works. And she looks so convincing, I’m not surprised Madhu doesn’t see through the disguise. W: And neither does Tarun. That’s Dharmendra. This guy is the secretary of the trade union at the textile mill that Shankar had bought from Mr Sinha. One day Tarun meets Ruma while she’s pretending to be a Pathan, and they become pals. D: Why does she go on pretending to be a Pathan? W: Why must you go on picking holes in the story? Does it matter why she pretends to be a Pathan? Maybe she’s a repressed cross-dresser and it surfaces now and then. P (placatingly): It doesn’t matter, really. Let her be a Pathan. But we can’t afford too many Pathan suits, okay? So she’ll always wear the same one. P: Hey, wait. I was thinking, maybe we could have some more disguises as well. Peps up the story. W: I’ve thought of that. Dharmendra can be disguised as a sadhu, and then Mehmood can be disguised as a Sufi. P: We’ll figure that out later. Let’s get on with the story! W: Right. Now one day Tarun goes to meet Shankar at his house, and meets Ruma in her lovely feminine form, and they fall in love with each other immediately. 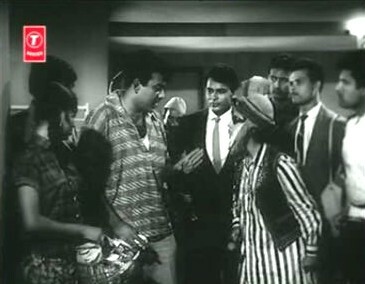 W: And then, Shankar meets Tarun and they exchange some heated words. Tarun is a sort of leader of the trade union, no? Shankar is very impressed with Tarun. W (annoyed): Why must you question everything? Let it be. He’s impressed. That’s it. W: Now, then. 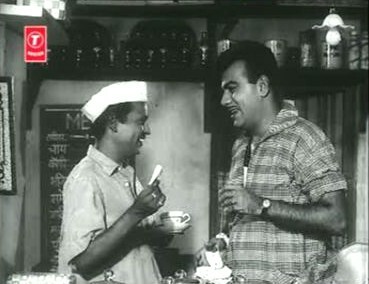 Tarun and his trade union leaders meet at Madhu’s tea shop, where they discuss their plans. Another person at the textile mill is Desai—that’ll be Rashid Khan—and he’s a slimy character who’s constantly trying to put down Tarun. P: Ignore him, writer bhaiya. Go on. W (with a meaningful sniff): And Tarun has his own problems. His father—that’s Shivraj—has delusions of wealth. He’s keeps imagining he’s got huge sums in the bank. W: Tarun and the other trade unionists stage shows, dances and the like, to gather money for their cause. P: Oh, good! Now we can have Mehmood in drag, and we can use all the hit songs of the past 10 years in a parody. D (plaintively, and ignored by the other two): But what connection does that have to the plot? P: Oh, by the way: what happened to Baani? You said she’d be plagued by tragedy. You got her married happily to a wealthy man; now what? W (rubbing his hands in glee): Just you see. She gets pregnant now. D: But I thought Shankar liked Tarun? W: Of course he does. Or did. Or whatever. Not always. Don’t you remember, I told you about Desai? He’s been needling Shankar at all the meetings of the board of directors. Every time Shankar tries to do something for the workers—like give them housing near the mill, or raise their wages—Desai obstructs him. D: Why? I thought he was for the workers. If he’s for the workers, he should be happy! W (losing his temper): Stop saying why!!! How do I know why? Maybe he doesn’t like Shankar’s face! Maybe it’s pure cussedness! But he does it! D: But if it’s Desai who’s obstructing Shankar, why does Shankar hate Tarun? P: Listen, guys. Let’s get back on track. What about Baani? How’re you getting tragedy into her life? W: Oh. Ah, yes. Well, you see, with all this turmoil, one day Shankar also discovers that Ruma loves Tarun, and there’s a big showdown and Ruma gets upset and Shankar gets upset… and then Baani gets upset and falls down. W (with satisfaction): No, not this time. That happens when she falls down a flight of stairs a second time. Then she has a miscarriage, and she’s told she can never bear a child again. P: Shouldn’t there be a mother figure here to be comforting her at this stage? W: Hmm. Yes, good point. Maybe the time-honoured good Christian? Oh, I remember: Baani has this maid called Philomena, who speaks awful Hindi but is really saintly. She’ll be the one patting Baani’s head now. D (perking up): I know! 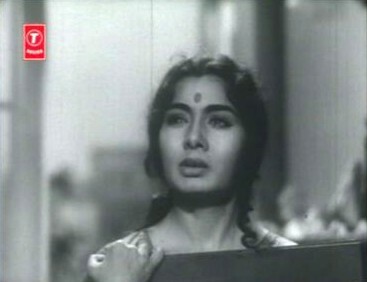 Achla Sachdev. She’ll be perfect for it! P (beaming): Splendid! Now everything’s in place. There’s strife and angst and turmoil all around, and everybody hates everybody else or has misunderstood everybody else. And we have some comedy, and we have disguises, and we have romance. This is going to be one helluva hit, guys! 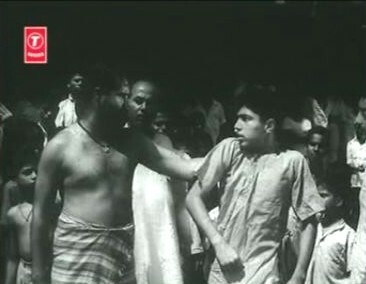 The writer, director and producer of Akashdeep, by the way, was Phani Majumdar. 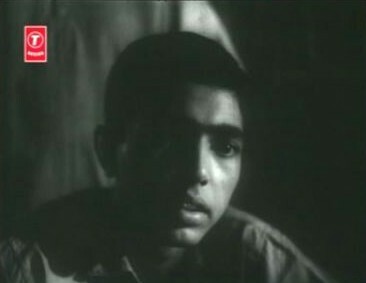 The screenplay was written by Navendu Ghosh. If you see these names in the credits for other films, you might just beware. The music, by Chitragupt. I saw the film because of Mujhe dard-e-dil ka pata na thha, but discovered that it also has two other songs that I like a lot but didn’t know were from Akashdeep: Mile toh phir jhuke nahin nazar wohi pyaar ki and Dil ka diya jaalake gaya. 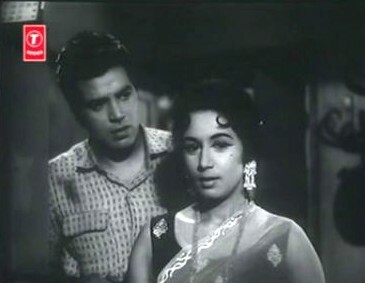 Nanda and Dharmendra. Eye candy! The plot—or what there was of it. This is a terribly muddled and incoherent film, with too many characters, too many plot elements and too many events that have little or nothing to do with the story. Every few minutes, there’s something that leads nowhere: Tarun’s loony father, Baani’s miscarriage and subsequent yearning for a child; Ruma’s constant dressing up as a Pathan… actually, now that I think of it, each of those could have been built up into an interesting enough film of its own. Together, it’s just one bewildering mishmash that is best avoided. Good write up as alwayz Memsaab… and yeah we can call this movie KHICHADI of sorts, boletoh mish mash, I enjoiied the movie on the big screen and now as home cinema. Arre, I’m not the memsaab! But yes, this was a big time khichadi; and unfortunately for me at least the taste of it was very off. The one major redemption was the songs – lovely. I have to re watch this movie again. Now gotta watch this one! Your review ensures that I do. Thanks! ash: No problem. Forgiven! ;-) And yes, the parody of songs that I mention above (“Now we can have Mehmood in drag, and we can use all the hit songs of the past 10 years in a parody.“) is the one you’re talking about. It parodies songs like Jo vaada kiya woh, Ruk jaa o jaanewaali, Ae gulbadan ae gulbadan etc. Hero Heeralal: Why on earth are both you and ash exulting over this film and wanting to see it?! The entire point of my review is that Ashok Kumar or no Ashok Kumar, Dharmendra or no Dharmendra, and good music or no good music, this is NOT a film to watch. It’s incoherent, illogical, badly scripted and poorly done. Watch the songs on youtube if you want to savour the film. And if you want to see Dharmendra and Ashok Kumar together, I’d suggest Mamta, Satyakam or Chand aur Suraj instead – especially the first two; they’re very good. yu know since I have this phillum on the disc, along with many many others, some mayb more sniff sniff than this, I always prefer big screen at home rather than the mini YT FLV formats on a PC. OH haanji have all 3 phillums yu mentioned of Dada Moni n Dharam Paajee, and yu can add Bandini (1963) and Ek Mahal Ho Sapno Ka (1975)…..hmm.m.. more… must check out. bollyviewer: Thank you so much! It’s so good to have people appreciate one’s attempts at humour. ;-) But seriously, I have no idea what Phani Majumdar was trying to do here – Akashdeep is so utterly convoluted. I think Ashok Kumar was/is acknowledged to be a great actor: one of the reasons he is cited as being so successful despite not being as eye candyish as most of his fellow leading men. Dustedoff: will steer clear fo this one: that Nanda-pathan outfit was the last straw for me. You know, bawa, I’d concur with what you say about Ashok Kumar. I’m not one of those who consider him very handsome, but when it comes to acting ability, I agree that he was definitely one of the best. Even in those early films – like Kismet – at a time when theatrical acting was the norm, Ashok Kumar is conspicuous by his very natural acting. And yes, Nanda in the Pathan outfit is certainly reason enough to give this film a miss! I still haven’t been able to figure out why Hindi films were so keen on making their heroines pretend to be men…. or is there something wrong with me, that I’ve never felt the need to paste on a fake moustache and pretend to be male? LOL! This is a fun review. But this review is great! Congratulations for coming up with this idea of telling us about it. W: Why? Do you want them to? Actually I burst out laughing at many places. Talking about Dada Moni and his performances, these 2 are def worth a watch if not seen, in both he has the main lead role, and what a performer. 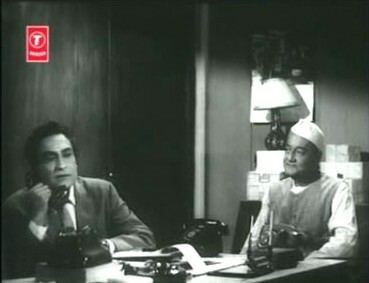 Akhtar-Ul-Iman had the dialogue writing department. Both phillums were loaded with VETERANS GALORE. ash: Will keep a lookout for those – I haven’t seen either of them, but am quite amenable to most films from the 70’s. It’s by the mid 80’s that the films worth seeing start dwindling. Sharmi: You’re a very brave lady to watch it again. Thank god, I didn’t buy this film; I simply rented it, and it’s gone back today. But would love to read your review of it! yu will note I am Dada Monis Pakka fan and there are 3 more, first one yu may have seen-OONCHE LOG ? The ever green JAA DIL E DEEWANA by Rafi Saheb is here, then AAJA RE MERE PYAR KE RAAHI, AJAB TERI DUNIYA. MD Chitragupta Saheb.Lyrics Majrooh Saheb. This one got a few weeks ago, and as far as I can see not listed, and I have not seen it so far either. TAXI DRIVER with Nirupa Roy,Helen, Anupama, Vishshal Anand, Asit Sen , Mohan Choti. MD is O P Nayyar.P/D Mohd Hussein Saheb, who made some very good entertainers thru his career ! Safed Jhooth- with Amol Palekar, Vinod Mehra, Devan Verma and Mithu Mukherjee. Director Basuda. MD Shymal Gupta bhau. Check ’em out when yu get a chance. It was a khichdi of many tales…Like you Mujhe dard-e-dil ka pata na tha was what led me into watching this movie. But it wasn’t just this song – I love Dil ka diya jalake gaya and Mile toh phir jhuke nahin . Since I had heard Jaa raha hoon (the parody song), I kind of liked it, not very fond of the picturization but I like the song. I didn’t find anything great either but was bearable and could sit through it coz of Dharmendra and Ashok Kumar and lovely songs. Btw, it was the first movie I had reviewed on my blog. ash: I must admit, I’ve not seen any of these films, though I’ve heard of Oonche Log and Safed Jhooth (I didn’t know there was a Taxi Driver, other than the Dev Anand-Kalpana Karthik-Sheila Ramani one). Will keep an eye out for them! 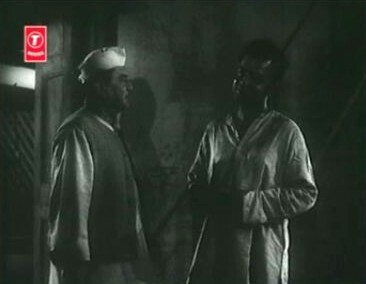 Satyakam is one of my favs too (and I’m very emotionally attached to it too) but this is one of those films where Ashok Kumar plays a dadaa ji or a senior person. It was great seeing him in lead roles in Howrah Bridge etc., or even in that Dilip Kumar movie where he’s at least not playing an elderly man (DK ki cchutti kar di thi dada muni ne :) ). ‘Chalti ka naam gaadi’ was another one where he played some kind of a macho man, and I found him better than Kishore in this one. bollywoodeewana: Yes, Kimi Katkar did look a lot like Nimmi, but I don’t think there’s really any evidence to prove that she was Nimmi’s daughter. One of those baseless rumours, I feel – probably just gossip that stemmed from the resemblance. Sorry, haven’t been able to find that medley of parodies on even any audio site, let alone a video one. It’s picturised completely on Mehmood and a bunch of girls as they perform a dance on stage. I’ve listed some of the songs in my comment to ash, above. Hero Heeralal: I was just joking! ;-)) Try and get hold of Ashok Kumar’s early films, too: Kismet or Samadhi, for instance. Or the classic Mahal. This man was such a good actor! I have that wonderful MEDLEY/PARODY of Mannada n Ashatai’s -Jaa raha hoon, will dig it out and post via file sharing, so watch this space. They were really employable, I have quite a few, will share as and when they are spotted. Willc omment later, jsut stole few minutes time to read the review, though could read on half of it. we have no time to stand and stare……..
Have been missing you in the blogosphere and am looking forward to that promised review of an Austrian film! I couldn’t find it on my laptop and I was so disappointed thinking I wont be able to upload it but was glad that Ash had it. However, I found it on youtube. Thank you so much – for taking the trouble of going searching for it! It’s a good parody of all those songs, even though Mehmood dressed as a fairy makes me cringe. Great review–the process probably did work like this. And reading all these Bolly reviews I’ve learnt a thing or two about what a plot should not be–handy for when I write a story. . Unlike some other commenters with better judgment and taste, I will see this movie. I see all Dharam movies during his garam years. Good bad evil, I will see it but maybe with fast forward on. The way I see it, I’ll be stuck watching reruns of Anupama unless I’m willing to wade in garbage. Phani Majumdar, multiple personality disorder victim! sophy: “The way I see it, I’ll be stuck watching reruns of Anupama unless I’m willing to wade in garbage.” True! I guess if one does want to see more of Dharmendra in his dazzling prime, one will have to put up with mediocre stuff like Akashdeep, Shola aur Shabnam and Anpadh. Thankfully, he did act in a LOT of films, so there’s hope for all of us! memsaab: And I just discovered that Phani Majumdar has the distinction of being the only Indian director to have directed films in 9 languages – including Malay. I wonder if it sort of puts one out of gear a bit if one’s being that much of a multilinguist – or is it simply another manifestation of a multiple personality syndrome?! 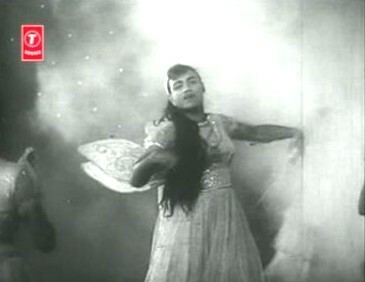 I think one should make a list of films where Mehmood appears in drag. I know it is silly, but it always makes me laugh. It is most of the times the same act but it is enough to bring in the laughs!!!! Who is that actor who spring sout of the well? It does me good to laugh after all the stress of last few weeks. 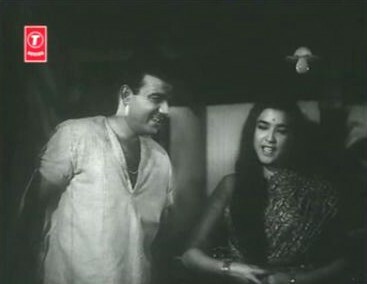 You are right Mehmood and Shubha Khote had great chemistry, they were in love at times, according to the press. Dharam and Nanda look great. Did they star in more movies? Hilarious review! Thank you for turning your movie watching pain into our amusement, Madhu. :-) Completely agree that the movie is crap, but oh the music – lovely, lovely, lovely. Hey, have tagged you. Please go look. 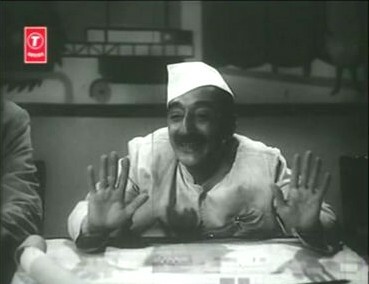 harvey: Yes, Mehmood and Shubha Khote acted in so many films together! Now if I see Mehmood appear onscreen, I automatically assume she’s going to be his love interest. No idea if that was for real or not, but they were good in reel life at least. The actor who springs out of the well? *confused* where? when? BTW, according to imdb, Nanda and Dharmendra acted together in two other films: Dharti Kahe Pukaar ke and Mera Qasoor Kya Hai. Haven’t seen either, so can’t comment! The thin actor I mean is from the MEDLEY/PARODY of Manna dey and Asha Bhosle’s -Jaa raha hoon. Oh, okay. No idea who that was. Naya Zamana (1971), Dream Girl (1976), Sachai Ki Taaqat (1989) and Return of Jewel Theif (1996) are other movies starring Dharmendra and Ashok Kumar. I discovered your blog after seeing your comments on memsaabstory. As I was going through your blog I found you have reviewed Aakashdeep. Yes you are right the songs are really good and the film is well you have given an apt description. One incident which I recall with respect to this film, I was very small But I do remember dad(Tarun Bose) saying that he had actually dozed off in a scene where he is shown seated somewhere and dozing. I think that was his last scene in the film, I do not remember I had seen it long ago. He was shooting day and night those days and was very tired. That was interesting, in the terms that, that one always thinks that only the big stars are busy with their work, but the character artistes are as busy if not more! Oh, that’s an interesting little aside! Unfortunately, the VCD I watched of Akashdeep was badly edited by the video company, I think – your father’s scenes were badly truncated. I think there was only scene, or maybe two, but very brief. That was disappointing for me, because I must admit to always looking forward to seeing Tarun Bose. He was such a fine actor, and had so much dignity. This review is just so brilliant! It is SO hilarious, it had me ROFL from start to end. Btw, I have seen Oonche Log and Aarti, both directed by Phani Majumdar. They were both pretty OK movies – so I wonder what went wrong here! Thank you, Raja! Yes, there was something seriously wrong with this film. I’ve seen Aarti too, and though it isn’t one of my favourite films, at least it was coherent. Poor Phani Majumdar seems to have gone completely off the rails as far as Akashdeep is concerned! I see you have mentioned Chand aur Suraj. Is there a dvd available? 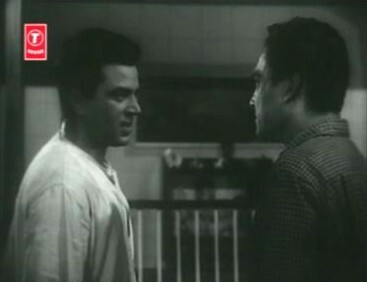 Although the film was a flop I liked dad’s role, Dharmendra, Ashok KUmar and the songs. Yes, Chand aur Suraj is available as a DVD and a VCD – it’s by T Series, I think. You can buy it online from http://www.induna.com: they’re extremely reliable – I do nearly all my DVD/VCD-buying from them. well, there is something definately wrong with Akashdeep which is quite strange.your review is spot on although you did a great mistake by asking people to avoid movies which have Phani Majumdar as director and Nabendu Ghosh as screenwriter.Phani majumdar,apart from having the distinction to direct films in 9 different languages,was one of the early pioneers in the hindi film industry and directed old classics like doctor ,kapan kundala and baadbaan.His other films like aarti and oonche log are also good.Not to mention his documentaries like shri aurobindo which were really great.And Nabendu Ghosh as a screenwriter is in an altogether different level.He is probably the best screenwriter that bollywood ever saw having penned films like Abhimaan,Sujata,Bandini,Pratigya,Teesri Kasam among others.His film Trishagni which he directed was a national award winner in 1988.Now,the question that begets our attention is how two very talented people can make make such a messy movie.Well,Akashdeep stands as a prime example of how even the best of the people can have bad days and make terrible movies.Another such example is Aashiq where two genuine greats like Hrishikesh Mukherjee and Raj Kapoor combined to give us a terrible movie. p.s: you are indeed lucky that you only rented this movie.But, i have a vcd of the film which i brought from a cd shop.Since ,i always buy dvd’s and vcd’s and never rent any,i have built a vast collection of truly terrible movies.But,i do revisit my collection of such movies from time to time so that i can truly appreciate good cinema.Such pathetic movies do help us to appreciate good or even average cinema more.But,i do hope to get rid of this stupid practice of buying of every dvd of every film. It would save me from a lot of pain.don’t you think so? But,alas i can’t leave this habit.oh,poor me? Well… I was trying to infuse a sense of humour into the piece when I said one might want to avoid any films of Phani Majumdar’s or Nabendu Ghosh’s! ;-) I have seen a few other films of Majumdar’s – Aarti, for example, which was not bad; or Kanyadaan, which while I didn’t sympathise with the Asha Parekh character (she was just too single-minded about whom she was married to), I could understand why she should be that way. The problem with Akashdeep seems to be more one of continuity and coherence. The story, ultimately, isn’t bad – but one would have expected a better end product – or at least not one so terrible – from a team consisting of these two. well,that was the same point i was trying to make.As i stated earlier , your review of the film was spot on,funny and very apt too.The point i was trying to make that both phani majumdar and nabendu ghosh should not be judged on the basis of this one-off blunder.Sometimes thing do go haywire even for the best in the business. p.s. 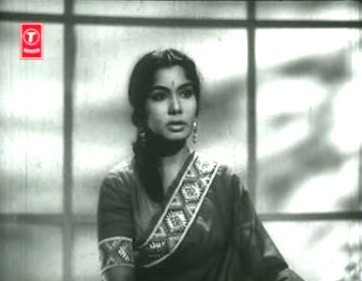 The Asha Parekh starrer Kanyadaan was not directed by Phani majumdar.It was directed by Mohan Segal.The Phani Majumdar directed Kanyadaan was the first maithili film ever made and started the maithili film industry.Phani Majumdar also wrote the screenplay of Meena kumari starrer Kaajal.Shakti Samanta too started his career as an assistant to Phanida.It’s another matter that the protege was far better than his teacher and surpassed his guru in all respects. You might think that I am a huge fan of Phani Majumdar but that’s not the case.But i cannot ignore his early contribution to the indian film industry having made early classics like doctor,kapan kundala etc.The fact that he made films in 9 languages including languages like maithili where no films were made ever before bears a testimony to his grand contribution to indian film industry.And i firmly believe in giving people their due even if they commit mistakes like akashdeep.As far as Nabendu Ghosh is concerned, i am a huge fan of his work which is quite evident from my earlier comment on this post.Sometimes i feel screenwriters,art directors,editors and cinematographers never get their due as most of the time actors,singers and music directors hog all the limelight with the directors and producers getting little attention.This phenomenon is rampant in bollywood where most of the people seem star-struck .These people cannot see anything beyond the stars of the film.Now, this is distressing.But, i do hope things will change in the near future. You’revery right about singers, MDs and actors getting all the attention (I think to some extent directors too), but people generally tending to ignore the more technical aspects – or even the writers – of a film. That is very unfair, I think – because a work such as a film is crafted bit by painstaking bit by people who often remain behind the scenes… it just so happens that the bulk of the public remembers only those they see and hear, not those who have made that particular camera angle so memorable, or have written a piece of dialogue that lodges forever in your mind, or have created a story that is impossible to forget… I certainly hope that changes. Oh, okay. I was mistaken about Kanyadaan. But Kaajal, yes – I liked that story. Madhu, I don’t think I’ve laughed so much – it hurts to laugh, woman! Every inch of me hurts, and I was spluttering so much through this review that I need a new keyboard now. Thanks for warning me off this one! Otherwise, Dharmendra and Ashok Kumar would have been enough for me to pick this up. And ignore anything by Nabendu Ghosh? You’ve got to be kidding! (as they say in yankee land). Think of Aar Paar, Teesri Kasam, Sujata, Abhimaan, Bandini, Yahudi et al scripted by this fine writer. He must have been hallucinating when he wrote Akashdeep. Or is this a completely different Ghosh? Honestly, I was just trying to be funny! :( Sorry. Guess my brain’s too fried to recognise humour! I hope your fever’s gone and you’re feeling better now, though! Just came to your blog and knew that you have watched Kanyadan. Can you please tell me how did get to watch that movie. Is there any VCD/DVD available? It was nice to read your blog. Had watched Akashdeep long ago on TV and found it boring. 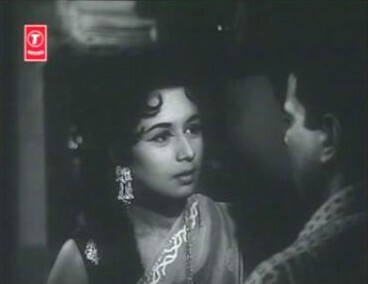 Nanda’s character was a bit too much..she played the pathan for too much of a duration that beyond a point it was boring. In Bollywood, films revolving around trade union problems have bombed save Naya Daur. Even when Naya Daur was remade as Mazdoor (Dilip Kumar, Nanda, Rati Agnihotri, Padmini Kolhapure) it bombed. Namak Haram, Iman Dharam, Sagina all of them tanked at the box office. Sheesha in which Mallika Sarabhai took on Mithun Chakraborthy sank without a trace despite having the older but beautiful Moonmoon sen in it. Isn’t it sad that Nimmi’s swansong was this incoherent,stupid movie though the song – dil ka diya jala ke gaya did justice to her acting expressions. I think the problem with Akashdeep was that it tried to be too many things at the same time. 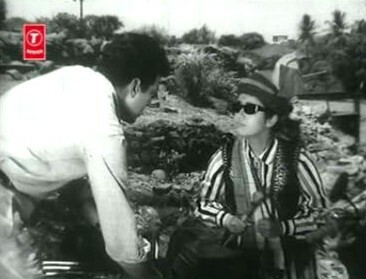 1965 was the time Dharam was introduced to Meena Kumari and so he & Nanda did not act in many films. Once a pair is a flop, no one wants to touch them again. Kimi Katkar was born towards the end of 1965 and Nimmi retired in 1964. It looks like a strange coincidence. Kimi could have been the veteran actress’s daughter but what was the need to hide it – Nimmi was married to Ali Raza, so why would she abandon her child ! Looks absurd and so I do not think there is any truth to all these baseless rumours. But I did read somewhere that Mehboob Khan did not get along well with both Meena Kumari and Suraiya so he never cast them. 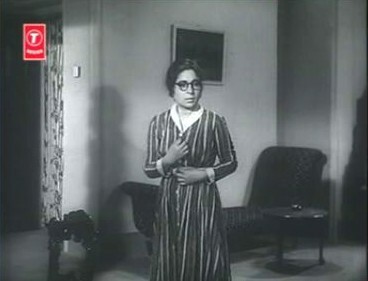 It really saddens me that Nimmi, a great actress, could have transitioned to strong character roles – it is reported that she didn’t have any children. If Waheeda Rehman, Sharmila Tagore and Mala Sinha could act in their sunset years, why not Nimmi? I hope guys like Shahrukh Khan and Salman Khan pull this actress out of hibernation. I have to admit that I’ve never much cared for Nimmi. Not one of my favourite actresses (too prone, in my opinion to overacting – her performances in films like Aan and Amar come to mind, though from what I remember of Akashdeep, she was rather more restrained and believable here). I really doubt if anybody could pull (and why would they?) Nimmi out of retirement. Seeing the way the world tends to forget even the luminaries who’ve passed on (a film magazine carried a tribute to Suchitra Sen, with a large photo of Leela Naidu beside!) – well, I wonder how many of this current crop of stars even remembers who Nimmi was. 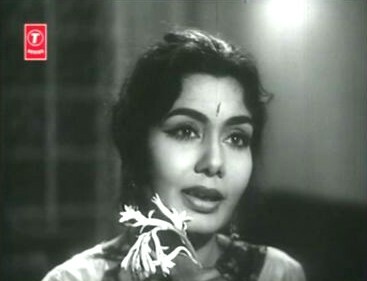 A Madhubala, a Nargis, or a Meena Kumari, yes; a Nimmi, possibly not. Sad. I was listening to some of Ron Goodwin music today and one of the pieces ( return to paradise ) which I heard for the first time reminded me of ” dil ka diya ” which Is a favourite. The beginning music is straight lift from Return to Paradise. Watching the song got my curiosity up about the movie. I also like the other songs from Akashdeep. Which led me to this review ( thought I will check it out before it turns out to be a dud with great music ! ). I HAVE NOT stopped laughing till the end. In fact I had to put my ipad down a few times so I could get hold of myself. What an innovative and a creative review ! Hats off to your flare for writing and imagination. Thank you for great entertainment much better than watching the movie. I will just listen to the songs :)..
Glad you liked the review, Neeru. :-) Yes, the songs of this film are far better than the film itself. i got so confused while reading the story, that i finally decided to leave it! dil ka diya, and mujhe darde dil ka pata are my all time favourites! even, the other 2 songs, mile to phir and kahiye jana are also equally good!